This is the website of someone who loves to eat. Cooking makes me happy too, but it’s secondary in my mind to the eating. I cook what I’m craving. As you can imagine, I now have quite the collection of spices and sauces on hand in my kitchen cabinets. (In particular, I have a bit of an Asian condiment and snack-buying problem…) I also eat out in restaurants. A lot. But there is nothing more enjoyable than sitting down, with friends, to a sizzling dinner or a fresh, colorful brunch that you’ve prepared yourself at home. I love to cook with friends, with music, and with an often-forgotten glass of wine on the counter. I don’t really love to cook with recipes, but I’ll try my best to measure or guesstimate the ingredients I use, just for you. This is also the website of someone who loves to travel. I’ve eaten pizza in Brazil, curry in New Zealand, and pancakes in Cambodia. I lived briefly in Spain and South Korea, and for a few years in Japan, so most of my travels have been in Asia and Europe. I plan to share a smattering of food photos from my traveling adventures here, mixed in among the recipes. I lived in Japan before the era of Top Chef, cupcakeries, food trucks with twitter feeds, and cooking blogs with cookbook spin-offs, but Japan was way ahead of the curve: it seemed to me that every time I turned on the television there, a food show was on. And not just a Julia Child-style how-to-cook show; a zoomed in close-up (part hedonistic, part sadistic) cook-off or taste-test or speed-eating contest or restaurant review, replete with backstories and lush images of every ingredient, and with famous TV personalities sighing, oishisou! (looks delicious! ), umai! (yum! ), or karai! (spicy!). I started taking food photographs too, just for the record… In the U.S., I used to feel a bit embarrassed taking photos of what I was about to eat; in Japan, I’ve always been in good company. 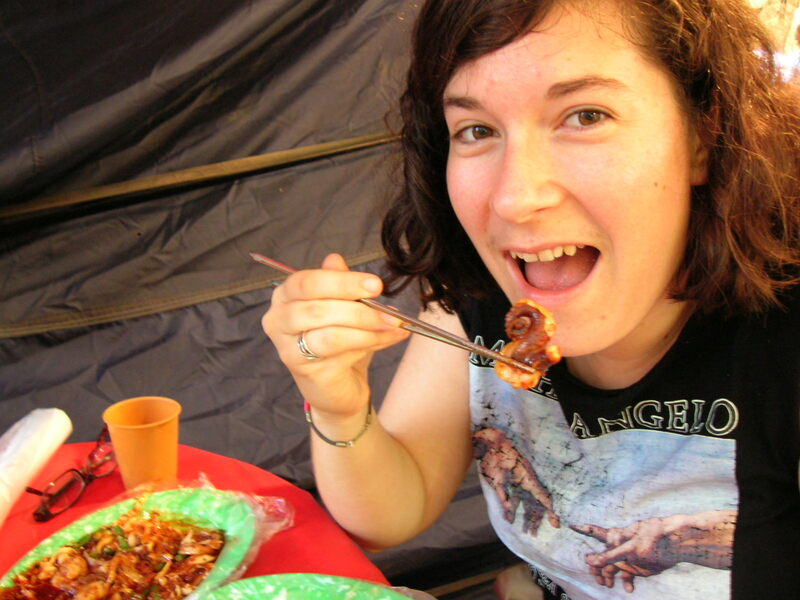 Eating Nakji-Bokum (Korean Spicy Stir-Fried Octopus) at an outdoor food stall in Namdaemun Market, Seoul, South Korea. All of this has made me an adventurous and enthusiastic eater. I’ve tried—and enjoyed—raw fugu (potentially poisonous blowfish) in Japan and squid cooked in their own ink in the Basque Country. Some of my cooking is in pursuit of re-creating something scrumptious I have eaten on my travels. The rest might be simply whatever I’m feeling like at the moment, or inspired by a new gift for my kitchen, or a Farmer’s Market produce purchase. I don’t eat pork or beef (for no particular reason other than 20 years of habit, but this might change, too…). I don’t have many fancy kitchen gadgets, but I absolutely love my cast iron pan (an excellent gift from a friend!). I was once intimidated by the complicated-seeming care instructions, but now I’m thoroughly converted, and I use it to make huevos rancheros or fried eggs nearly every morning. I also love going thrift-store shopping in search of new (old) dishes. I’m a language nerd. I speak Japanese and Spanish, and I’m studying Korean and Arabic. (I also know a tiny bit of some other Romance languages and ASL, and would like to learn more.) I use the life-changing (and free) Anki to study language flashcards. My wife’s name is Paula. She’s a certified ophthalmic assistant. She bakes all of the bread around here, and sometimes writes guest posts like this one. I’m not a morning person, but brunch is my favorite meal. I have a special fondness for tomatoes, eggs, and cilantro. huevos rancheros, oyako-donburi (Japanese chicken and egg over rice), kimchi fried rice, poached eggs over sautéed kale, chana masala, saag paneer, mango lassi, gazpacho soup, pita chips, vegetarian sushi, Thai yellow curry, tom kha gai soup, avocado tomato toast, and blueberry muffins. crepes, Vietnamese spring rolls, chicken mole, malai kofta (Indian curry with cheese and vegetable dumplings), samosas, pad thai, sashimi, agedashi-tofu (Japanese deep-fried tofu in ginger broth), steamed shrimp dumplings, pickled tomatoes, chilaquiles, eggs benedict, and lemon bars. I hope to cook my way through these recipes and more, while sharing my kitchen successes, failures, and tips with you. I hope to hear from you, too: I welcome your comments on recipes if you have questions or suggestions of your own! great blog, allison! so glad i found you!! What a lovely site – everything looks so fresh and appealing! Thank you, Jenna! I’m always glad to meet other tomato fanatics! That would be a definite perk of living in Florida… California is pretty amazing in that way, too (especially compared to Wisconsin, where I’m from, which also has awesome farmer’s markets, but only from April through October). I just awarded you with the Dragon’s loyalty award – come check it out! I think I am going to enjoy following your blog. Keep up the wonderful work, fellow traveler. Isn’t it just wonderful to have an adventurous palate?! Los txipirones en su tinta del Pais Vasco es una receta que a nosotros los vascos nos encantan junto con la merluza en salsa verde y el bacalao al pil pil. Saludos y miraremos mas a menudo tus post. Me gustaron mucho los txipirones en su tinta que comí en un viaje a San Sebastián (¡hace diez años!). Nunca he probado merluza en salsa verde ni bacalao al pil pil, pero por supuesto me gustaría probarlos. Me alegro de haber descubierto tu blog también. I know you’ve already amassed a ton of these, but add my nomination to the list for another Versatile Blogger Award! You can find the info on my Awards page at http://feedingdarragh.com/awards/. Aw, thank you! That’s so nice of you—I’ll go check it out! Nice to meet a fellow capricious vegetable! Anyway, I hope you’ll continue to check back for more recipes, and I hope you’re staying warm in Madison; I’ve heard it’s the worst winter there in ages! OMG! I am so happy I came across your blog so that I can try out your delicious recipes! I am so sold. Keep it up! Thanks, Olena! And welcome! I love the enthusiasm. :) I’d love to hear how you like any of the recipes that you get a chance to try out! Interesting blog, definitely something new and unique every post, I love it! Hi. Thank you for following my blog. I saw you had lived in Japan and South Korea. Am quite jealous! I’m just started exploring these cuisines. Your blog has great food, love to read some more. Luckily there are lots of Korean restaurants nearby where I live. Plus supermarkets. I don’t have that much patience though, compared to some other bloggers my efforts are quite humble. But I really love making boxed lunches and that’s the main thing anyway. Yes, and boxed lunches are the best! We nearly always pack lunches from home using dinner leftovers from the night before—though usually that means just one main dish + rice, rather than a variety of small dishes, like a real Japanese bento lunch. I have a few nice bentos from Japan that we occasionally use to bring lunches, but some of them aren’t microwaveable, so they don’t get used very often. Hey Allison! I really like your Blog it’s fresh and different! Cant wait to try your recipes! Hi Allison! I also have nominated you and your lovely blog for the Liebster Award! Thank you for visiting my blog and taking the time to look at so many of my posts. I loved reading your about page and I’m happy to have found your blog too. Thanks, Apsara! Yes, some of what makes Japanese food so good is sometimes the attention paid to the presentation, but also I’ve really enjoyed so many things I’ve eaten in Japan—even slightly odd, non-traditional Japanese twists on international food, like at Italian or Indian restaurants in Japan. In my experience, so many restaurants there are so good at putting the TASTE of food first, even above the presentation, and that makes me respect those restaurants so much more than all the mediocre-food restaurants that are par for the course, at least in southern California, where I’m living right now. Fabulous blog and glad I stumbled upon it! Hi, and welcome! Sorry to hear that you discovered the huevos rancheros too late to make them before work… they also make a pretty good dinner! Hi Allison! I’m so happy I found your blog! It popped up on my wordpress reader and who can resist the name “Spontaneous tomato”?! Love it! I’m new here :D and this blog is like… PARADISE *-* It make me so happy having began a blog too when I see how good it can become. Sorry I got carried away a bit , probably because i’m a big food lover . I´m a huevos rancheros lover too!!! I´m gonna enjoy this blog! Hi Allison, great blog. I don’t know with recipe to start, so glad I found you again! Woah! Cool blog! I am a lover of food and cooking as well (had a food blog previously) AND I love learning languages. Awesome. What an awesome blog!! I love all of the asian recipes you have too! I have spent some time travelling in Japan and though out south east asia and am completely in love with all asian foods. I have not been to Korea yet but it is on my list and I know I will get there one day. For now I will enjoy reading through your blog and making some of these delicious recipes!